Go mobile and boost your appeal to this time-strapped crowd. By 2017, the global facility management market is expected to reach nearly $395 billion. And within that market is an extraordinary opportunity for marketers to reach key facility management decision makers. But first, we must understand the duties, characteristics and behavioral drivers of this audience. These professionals have more tasks to do and less time to do it. Whereas they used to rely heavily on pencil and paper and pagers, facility managers are turning to smartphones and handhelds to increase efficiency, reduce manpower and to become more accessible. 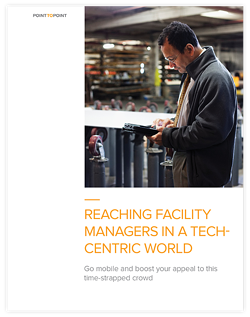 In this report, we explored the role technology plays in the daily lives of facility managers and compiled recommendations to connect to this audience from a marketer standpoint. Fill out this form to receive our report on reaching facility managers now.